It’s been one of those crazy weeks. Work has pretty much swallowed me up whole and there’s not much left of me for anything else. Not that I’m complaining because the work I’m doing is fun and exciting and I’m using all my skills and honing them into lean, mean machines. Which brings me to this post. French toast. I’ve been making it for years. As a kid, I would help my mom make it and when I got a little older, I took over the task. It’s simple breakfast that almost seems too simple (which is probably why I’ve never posted a recipe for it here on this blog). I didn’t think I had anything to learn about french toast. This Saturday morning french toast was on the agenda*, but I decided to go about things a bit differently. First off, I had some really, really wonderful day-old sourdough bread that I purchased from a little shop 3 blocks away. A sliced it up thick but instead of doing the same ol’ dip and dunk into the egg mixture, I decided that this thick bread really deserved a good soaking. Once it had it’s luxurious egg bath, I fried it up as usual, but decided to take extra care that it was cooked through by plopping the whole shebang onto a cookie tray and into the oven for a bit of solid heating. Little did I know that baking had the effect of puffing up the toast into wondrous bites of deliciousness hereby unknown to me! How could french toast — which has long been a breakfast staple, suddenly blossom into this sophisticated dish? Whatever happened, I can now call this the best french toast I have ever had the pleasure of eating. It’s sweet and fragrant with cinnamon and vanilla and the smells coming from your oven will rouse the most sleepiest head. Divine! Place sliced bread in a large baking tray. In a large bowl, whisk together remaining ingredients (not the butter!) until foamy. Gently pour egg mixture over the bread and let sit for 15 minutes. Turn bread over and let sit for another 15 minutes. Preheat oven to 350. In a large skillet, melt 2 T of butter. Working in batches, add bread to skillet and cook until golden on both sides — about 2 minutes per side. Transfer to baking sheet and bake until french toast is slightly puffed and golden, about 15 minutes. Serve with maple syrup or fresh berries. * Uh, I don’t have a breakfast agenda…but wouldn’t it be wonderful if I did? Mmmmm. You can also let the bread soak in the egg mixture overnight — I did this on Christmas Eve so I wouldn’t have to make anything the next morning! I’ve always had trouble with French toast, as much as I love it. I really like this recipe because it’s traditional. 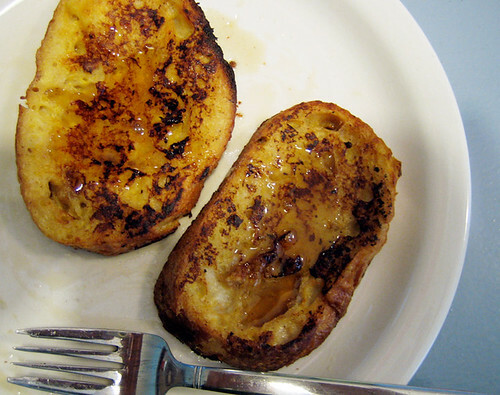 It’s the simplest way for French toast to be and it looks like it came out incredible. I’m going to give it a shot. 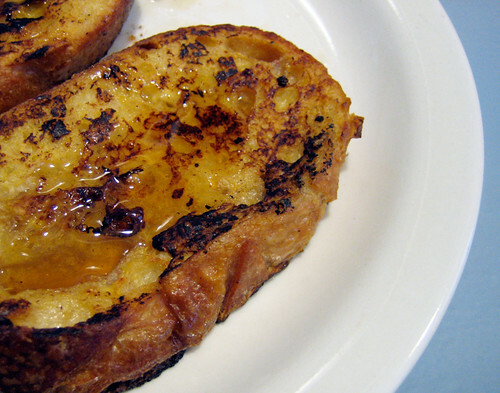 I just made delicious French toast yesterday with challah bread. It was great, but I may try this version next time if I remember! If you want to skip the oven, you can get similar results by using a skillet with a lid and lowish heat. Preheat th pan with a lid on, toss in the butter and replace the lid while the butter melts, add the well-soaked (always well-soaked) bread and cover again. Let it fry like this for about 5-8 minutes a side (until golden). It cooks through and you don’t have to wait for the oven’s lengthy pre-heating. I always toss about a tsp. of sugar into the egg mixture and just have it with butter and a bit of powdered sugar (no syrup required). As a kid I never tried french toast, as I had a hatred towards eggs. The only thing like it i’ve had is vegan french toast in recent years, which has always done it for me. Over the past year though i’ve tried to make myself like eggs, and your love of this recipe makes me think it’s about time I try real french toast! I will have to give it a try. That sounds great. What was the name of the store/brand of bread? Looks yummy..I love thick french toast. Have you ever made it with Challa bread? Or panetone? Yum! I have made thick french toast with some fig and anise bread it was really good! I like the tip about the oven…sounds great. ooh, I love it when things like this happen! Just when you think things can’t get any better…. It looks so golden, delicious! kristen, nice tip about the overnight soak! bijoux, i don’t find these too eggy at all, so maybe give it a try and who knows, maybe you’ll like it! thanks cookinpanda, this is pretty traditional and it works wonders. french toast with challah bread, gretchen? sounds awesome. hag, who knew that by throwing it into the oven a whole new beast would emerge. yum. vegan french toast? i’ll have to find a recipe for that. thanks for the inspiration, ventures! jennie, love the idea of tossing in bailey’s! i did that once to some waffle batter…yum!! yes, patricia, start with this one. it’s a keeper. give it a try, kali! I totally know what I’m doing my next day off!!! Yum! I had french toast for the first time in yonks last weekend, made by DBF and slathered with lemon cream. It was SO GOOD. I should make French Toast more often. Next time I’ll try it like this, it looks extra good. I linked to your blog from mine, hope you don’t mind. Oh my…i feel like a Pavlovian mutt..that sounds so good and I love french toast anyway…..
Gorgeous! Wish I could pull up a chair at your breakfast table. Mevrouw Cupcake, slathered in lemon cream? yummers! coopernicus, i understand that pavlovian response completely! yum. Jody, i hope you try this version. it’s pretty awesome! Cookie baker Lynn, the chair is waiting! Wonderful! Love a breakfast for dinner every once in awhile. Oh Yum. I’m going to try this at the weekend. Which is tomorrow. Yay! I had french toast this morning, but it looked pretty sad compared to yours. It’s usually a clean-out-the-bread-box dish, but that’s so not fair, is it? I am always on the look out on ways to improve one of my favorite breakfast items. Thanks for the recipe. I love the idea of a breakfast agenda. Mine would have to include hollandaise. I’ve actually never made french toast myself, but there’s a cafe near me that makes phenomenal french toast and serves it with poached pears and spiced mascarpone. I imagine that with a little forethought I could put all these things onto a special occasion breakfast agenda. I shall definitely have to have a go. Using either your own bread, or at the very least unsliced bread from a bakery is an essential component to good french toast, because you want it thicker than your normal sandwich slices. my two french toast secrets are soaking it overnight and baking it the next morning in the oven and also using challah bread. sharona may, breakfast for dinner is indeed something wonderful once in a while! aimee, i think french toast is the perfect way to clean out the bread box. sometimes you hit paydirt and have great bread that needs to be used up and that makes your french toast that much better. enjoy, artisansweets! 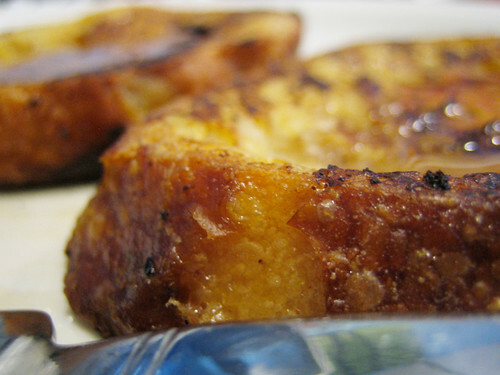 this is a great way to make french toast extra special. rach, i guess a breakfast agenda is the way to go! rox, i’m going to have to try challah next! Try Coconut milk instead of diary, and you can substitute eggs with mashed bananas. It is little sweeter than normal, but OMG so delicious! Challah is a great variation, as is brioche and thick sliced raisin bread. Sometimes I dry it in olive oil to get a bit more fragrance to it. If you want really crisp French toast, dip it in flour after you soak it in egg, and then fry in olive oil or clarified butter. That way you can fry at a higher temp without burning the butter. hi there, just wanted to say thank you for this recipe – we just made it this morning for a special father’s day breakfast, and he – a real french toast connoisseur – proclaimed it a winner. we took some of the tips in the comments about soaking overnight, and this also worked a treat as it made brekky that much simpler in the morning. we’ll never look back! I was looking for how to cook thick bread into french toast this morning and ran across this.. and it was super tasty. I had company and everyone liked it.